Here’s another dish that I’m sure most of you will find thoroughly delectable. Gingerbread pancakes. This is a recipe from a Japanese filmmaker friend of mine. I think you’ll find the smell of cinnamon, ginger, cloves and molasses will work to created a sensual and unforgettable experience, not to mention the pleasure you’ll have in eating them. Tuck this recipe away for Christmas or Hannukah, when the warmth and joy of the season be undeniable as you bite into these surprisingly light, cakey pancakes. 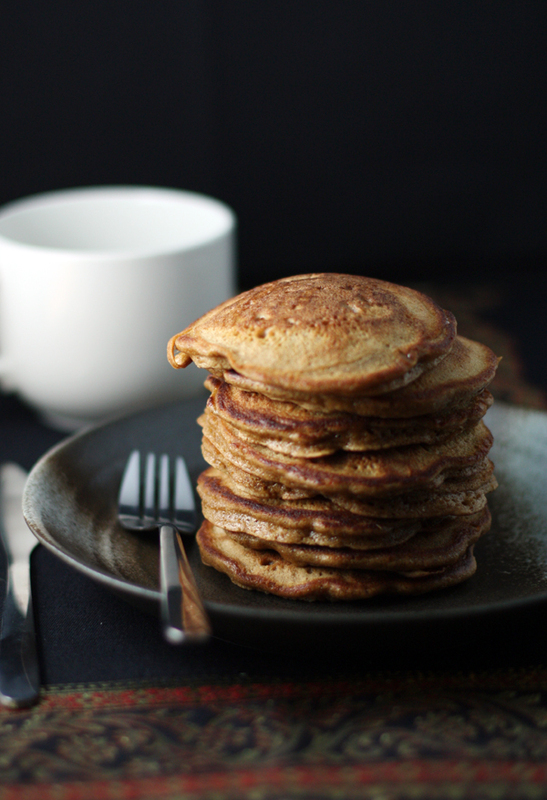 Sitting down to a stack of delicious gingerbread pancakes and a mug of fresh, hot coffee or cider is the simple enough to start any chilly winter morning and festive enough to serve on Christmas morning, or – if you’re in Australia – have some now. Brrrrrr. Also, pancakes are great to make in large batches because you can easily freeze the leftovers, pop them in the toaster, and enjoy them any day of the week. To make the orange blossom maple syrup, in a small saucepan over low heat, warm the maple syrup. Pour into a small bowl or pitcher and stir in the orange flower water and vanilla until well blended. Serve warm. Or, store in an airtight container in the refrigerator for up to 3 days. Warm over low heat before serving. In a large bowl, whisk together the flour, baking powder, baking soda, salt, cinnamon, ginger and cloves. In another bowl, whisk together the brown sugar, eggs, molasses, 2 Tbs. of the melted butter and the water. Add the brown sugar mixture to the flour mixture and stir until just blended. There will be some small lumps. Place a large griddle or fry pan with low sloping sides over medium heat until hot enough for a drop of water to sizzle and then immediately evaporate. Brush with some of the remaining melted butter. For each pancake, ladle about 1/4 cup batter onto the hot surface. Reduce the heat to medium-low and cook until small bubbles appear and the edges start to look dry, about 4 minutes. After 3 minutes, lift a pancake to check if the underside is done; do not let the pancakes darken too much. Carefully turn the pancakes over and cook until lightly browned on the other side, about 1 minute more. Transfer to an ovenproof platter and place in the oven to keep warm; do not cover the pancakes or they will get soggy. Repeat with the remaining batter and butter to make about 8 pancakes, each about 4 inches in diameter. Serve the pancakes immediately, accompanied by the syrup. Serves 4.